Chicago's Uptown: Struggling or thriving on diversity? Part of Uptown's Asian community on Argyle. Some Chicagoans see the north lakefront community of Uptown as the next "hot" neighborhood, an area with still-affordable apartments in one of the city's most exciting and vibrant areas. Others see it as a rundown neighborhood that peaked decades ago, crippled by a high crime rate and a proliferation of seedy bars. Some call it an immigrant's dream, a low-rent mecca where new arrivals can establish themselves until their hard work allows them to move to more affluent surroundings. Some merely call Uptown home. Political and economic analysts have called Uptown a battleground between the rich and the poor, specifically on the matter of housing. Will market values turn Uptown into another upper-middle-class lakefront community, thus making it unaffordable to many who now live there? Or can Uptown thrive as a multi-ethnic, multi-income community? It's a battle that has had citywide political overtones. It didn't take long after Harold Washington's death in 1987 for the late Chicago mayor's old foes to reassert their power. On a local ward issue, the sort of matter aldermen pass routinely for each other a matter of courtesy, staunch Washington ally Helen Shiller took a fall. Shiller, a rookie alderman from the 46th Ward, had won election largely through the support of low-income Uptown residents worried about losing affordable housing. She offered a proposal that would have made the city accept a consent decree to settle a 12-year-old lawsuit. The 1975 construction of Harry S Truman College in Uptown resulted in the loss of about 3,000 low-income housing units. The consent decree from the subsequent Avery v Pierce suit would have put most vacant parcels in Uptown into a community-controlled land bank for future affordable housing. It also would have established a "desirable" goal of 3,000 low-income units there. The Washington-backed proposal was on the brink of passage when he died. Less than a month afterwards, Washington foes brought it out of committee with the express intention of killing it. Not only did the desired properties not go to the affordable housing advocates, but they went to one of the local players Shiller and allies disliked most. The properties reverted to county control, and many were bought at a tax sale by Randall Langer, a young developer who expressed interest in gentrifying the neighborhood. In 1985 Langer had aided the creation of a local historical district, which foes said was of dubious historical value. They charged the district was created merely to facilitate gentrification, which would force out low-income people. In what might be called a class struggle in Uptown, it appeared the moneyed interests had won. But five years after the Sheridan Park historical district took effect and three years after the Avery consent decree was rejected, Uptown has failed to become "Lincoln Park North," an extension of a completely gentrified neighborhood to the south. True, young professionals are no longer a rarity in the neighborhood. And, yes, hundreds of Uptown residences have been rehabbed over the last decade. But the wholesale economic shift many predicted only a few years ago has yet to arrive. This doesn't mean that all groups necessarily like each other. • Vince Clark, Uptown Chamber of Commerce: "I think Uptown is on the upswing, although it won't happen in the next year or two. It's the next Lincoln Park. It's the only part of the lakefront not fully developed. There are a lot of properties built up here, a lot of renovation." • Sue Ellen Long, rehabber and property manager: "A lot of people here feel the balance has shifted to the middle and upper class. But a lot of people don't want gentrification. They like the diversity." • Thorn Clark, writer, teacher and activist: "I don't think you can make the case yet that the area will be gentrified, another Lincoln Park. The historical districts did not bring about as much property value appreciation as the real estate marketers were hoping for." • Pat Resky, Uptown Chicago Commission: "We have a higher minority population now than during the last census and more low-income people. I'm not seeing rehab work that is causing low-income people to move out." • Kathreen Wales, Arts Bridge: "The area is undergoing economic revitalization. We're trying to make ourselves a key player in this process." • Josh Hoyt, director of Organization of the Northeast and former director of the Citizens Utility Board: "It seems to me that the strategy to gentrify has hit a brick wall. The community remains extremely diverse and still with a lot of poverty. Vacancy rates are high, and buildings are on the market a lot longer now." • Scott Gelzer, M.G.T. Cornerstones (an Uptown management consulting firm): "I see hope that various interests in Uptown can work together. Previously, Uptown had a great reputation for 'community theater' meetings where people spent most of their time waving fingers at each other. Now some nonprofits and business groups are at least beginning to talk to each other." • Luz Martinez, Voice of the People: "Perhaps speculators are hurting conscientious developers. They're sitting on buildings, waiting for them to appreciate and letting them run down. Very few people are willing to pay $1,000 rent to live next door to a building where they're selling drugs." • John Plunkett, director of Just Jobs (a nonprofit temporary employment agency): "Economic conditions have caused a change here. In Uptown most lower-skill jobs are outside the area. What you're talking about here is more of a bedroom community." 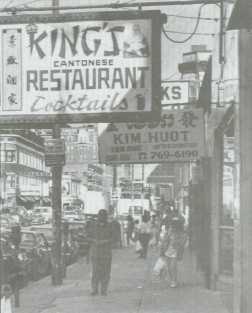 • Pete Ella, Asian Human Services: "Uptown will be growing into a new Chinatown for southeast Asians." • Randall Langer, Uptown developer; "Uptown five or six years ago hit rock bottom. People were taking their money out of the neighborhood. But disinvestment has stopped. It's a good, diverse community. I see a good mix happening." • Mary Ann Smith, alderman of the 48th Ward, which encompasses the northern third of Uptown: "The diversity here is a tremendous amount of fun. You can be what you want to be." Pro-development forces may still feel that Shiller keeps her 46th Ward a low-income haven to protect her political base, and development opponents may still believe that gentrifiers want to run the poor out of Uptown. But the rhetoric of a few years ago (The Neighborhood News charged that Langer was ''turning a neighborhood by changing its name," and the Chicago Tribune countered that Shiller campaigned "to keep the ward crummy") has calmed considerably. Even more amazing, all sides are willing to communicate civilly. Note the word "all." The area bounded by Foster Avenue on the north, Irving Park on the south, Ravenswood and Clark on the west and the lake on the east has seen high society and lowlifes, millionaires and paupers, artists, professionals, entertainers, thieves and common people from virtually everywhere, often located cheek to jowl. In fact, it's almost hard to believe that such a compact area contains so much variety: everything from stately, neatly kept mansions to mammoth high rises to vacated buildings whose boarded-up windows serve mainly to display posters for upcoming rock concerts. Much of the land east of Sheridan Road contains high rises; this is the buckle of the lakefront's "condo belt." Nestled among these buildings are old, stately homes, Kenmore and Winthrop house most of the area's black population. Broadway, glitzy and tawdry at the same time, forms the north-south spine of the area. To the west lie tranquil streets that contain most of the area's small number of single-family homes. Annexed to Chicago with the rest of the town of Lake View in 1889, Uptown immediately experienced a boom. Chicagoans desiring a more suburban setting and encouraged by the 1900 construction of an elevated line to Wilson Avenue, flocked to this suddenly accessible neighborhood. By day, they romped on the beaches at Clarendon and Wilson avenues, the most popular in the city. By night, they sipped brews or danced to orchestra music at the spacious beer garden of the Bismarck (later "Marigold," when World War I suddenly made the name "Bismarck" unpopular). The wealthier residents made their way home to lakeside mansions in Uptown's southeastern section. Land values skyrocketed. Developers found it more profitable to construct apartments and residential hotels than single-family dwellings. Many young adults gravitated here, lured by reasonable rents, good public transportation and exciting night life. Remnants of the night life can still be found. The Uptown and Riviera theaters, both near Broadway and Lawrence, attest to the former opulence. The Aragon Ballroom, at Lawrece near the el, was arguably America's most famous dance hall in the 1930s. Since then, it has served as a roller rink, psychedelic rock palace and, now, home to Hispanic musical acts. This is the center of Chicago's Uptown neighborhood, at Wilson and Broadway, with its stop for the elevated mass transit. The Depression hit Uptown hard, and World War II caused a great change. During the war, a housing shortage prompted Uptown property owners to subdivide apartments into even smaller units. The neighborhood declined precipitously. "A conglomeration of cheap assignation houses, dope peddlers, and the ubiquitous burlesque bars . . . sprang up there and never left," according to a postwar account. Housing changes brought about by the war led to large-scale immigration afterwards. Uptown, once affluent, became a port of entry for new arrivals seeking cheap housing. Appalachian Americans came in such numbers that Uptown was derided as a "hillbilly heaven." Soon afterwards, American Indians made Uptown their Chicago home. Since then, Hispanics, Asians, blacks (African, Caribbean and African-American) and eastern Europeans have made Uptown Chicago's most racially diverse neighborhood. The spate of new arrivals outpaced the affordable housing supply. Other events conspired to cut back low-income housing even further. The 1975 construction of Truman College made its mark. A few years later, arson-for-profit became almost epidemic. This illegal form of urban renewal had at least tacit city blessing, Shiller asserts. "When the fires occurred, the fire department would take half an hour to answer even if the fire was across the street," she said. By the late 1970s Uptown came close to hitting rock bottom, and part of it "seceded." In the 1930s, the city had designated 75 official community areas, including an Uptown extending north to Devon. In 1980, middle-class residents of the northern Edgewater neighborhood, wanting to disassociate themselves from the unsavory reputation of Uptown, petitioned Mayor Jane Byrne for a separate community. Byrne, seeing the possibility of votes, pushed that request through the city council. But in the 1980s parts of Uptown started to see a revival. The southeastern neighborhood known as Buena Park became an historical district in 1984. Rehabbers thus became eligible for an income tax credit of up to 25 percent of the restoration cost. Few protests met the historical designation for an area dotted with well-kept Queen Anne homes that was, at one time, the most fashionable residential district on the north side. Sheridan Park was another matter. Previously, the district bordered by Clark, Racine, Montrose and Lawrence was known locally as Heart of Uptown. It contained a few buildings of architectural interest, but mostly it was standard multi-unit rental fare. But the historical designation of Sheridan Park opened up more rehab credit money — and more controversy. Many questioned whether the architectural quality of the entire Sheridan Park area merited landmark status. Former Uptown resident Thorn Clark, a writer specializing in neighborhood development issues, dubbed Sheridan Park an "hysterical district." Shiller said, "Individually, there are buildings with historical value. As a whole district, no." She added, "From the point of view of the people living here, 'historical district' doesn't mean anything. It only accelerated the process to move poor people out." Langer, one of the proponents of the historic district, called it a godsend. "I'm grateful historic status came," he said. "Without the historic designation, 10 or 12 empty buildings would have been demolished. It probably saved those buildings." The poor people, however, have not gone as fast as some might have hoped and others might have feared. If anything, the numbers of low-income people may be rising. A 1988 study by the Chicago Reporter showed that the number of public aid recipients in Uptown actually increased from 13,903 to 17,619 between 1980 and 1987.
room occupancy) Apartments in 1988, has embarked on another conversion project, thus helping to expand an otherwise dwindling housing resource for single, low-income people. A religious group, Jesus People USA, a communal group affiliated with the Evangelical Covenant Church, bought a former retirement hotel this year to rehab for low-income housing. Voice of the People, a housing alliance created in response to the Truman College displacement, rehabs and manages affordable units. A recent government decision may keep such housing within reach for Uptown's low-income residents. Ten buildings housing about 11,000 people were given mortgages by the U.S. Department of Housing and Urban Development in the 1960s. After 20 years, building owners could prepay the balance of their low-interest mortgages, end their obligation to provide subsidized housing and then raise rents to market rates. A coalition of community groups, meanwhile, backed pending federal legislation that would bar such prepayments (slightly differing Senate and House bills now sit in a joint committee). Meanwhile, community groups such as Uptown's Organization of the NorthEast (ONE) won a major victory in September when HUD Secy. Jack Kemp agreed to call a moratorium on prepayments of the HUD buildings, including an Uptown building at 833 West Buena. The moratorium may have political as well as economic overtones. A handful of votes from poor people not forced out of the area may make the difference next February in a ward where a thousand-vote margin is considered a landslide. Shiller, a former editor of a leftist magazine called Keep Strong, narrowly lost an aldermanic election in 1979. Eight years later she defeated anti-Washington incumbent Jerome Orbach by fewer than 500 votes, thanks to longtime ally Walter "Slim" Coleman, a veteran organizer whose 1983 voter registration drive proved instrumental in Washington's mayoral victory. This time Mike Quigley, attorney for a development group and former aide to 44th Ward Ald. Bernard Hansen, looms as her main opponent. Only a few months ago, conventional wisdom had Shiller heading for oblivion. Now, opinions vary. Private rehabber and property manager Sue Ellen Long commented, "She doesn't have the clout, through Washington, she had before." Clark, however, stated, "She's making points with the middle class — with street repairs, unclogged sewers, preplanned street cleaning. She has serviced the ward better than people have seen for years." A third candidate, educator Vince Samar, may siphon enough votes from one of the two frontrunners to determine the winner. It may be an entirely different wild card that determines the course of this election. Gentrifying yuppies and the underclass are not the only elements who make up the hodgepodge that is Uptown. Immigrants, particularly southeast Asians, have made their mark in recent years. "Argyle Street on a weekend is amazing," claims Long. "People come from three or four states to buy, shop, pretend it's Little Saigon. The Asians here don't consider themselves a low-income minority community. They are prospering." "Refugees from the former Indochina nations — Cambodia, Vietnam, Laos — came to this neighborhood because of the social service facilities available," said Pete Ella, director of Uptown's Asian Human Services agency. "Many of them set up businesses on or near Argyle. While other Asian immigrants, such as Filipinos and Indians, arrive with the advantage of knowing the English language, the southeast Asians turn what would be a language handicap into an advantage by providing needed products and services to their countrymen." Not only southeast Asians set up shop here. One can stroll around and find an African crafts store, a Spanish language book store, an Iranian grocery. Hungry visitors can eat Mexican, Cambodian, Cajun, Thai, etc. Different, yet also notable groups, have made their presence felt. According to the Illinois Arts Council, one-tenth of the state's visual artists live in zip codes 60640 and 60660 (Uptown and Edgewater). "A lot of nonprofit and arts groups are coming in," said Long. "That's a very good sign. They move where it's affordable." One group uniting the world of arts and that of nonprofits is Arts Bridge, which has adopted the incubator system used for years in the for-profit sector and applied it to artistic groups. Present clients include such diverse elements as Chameleon (a multicultural women's ensemble), Kidworks (a children's theater), Partners in Mime (a mime troupe), James Chorale (an early to modern chamber ensemble) and Playwright's Center (a theater group). Arts Bridge manager Kathreen Wales commented, ''Organizations have be be nonprofit, show artistic promise and be committed to the business end of things. We offer each group its own space, plus shared assets such as office equipment and a library. We also hold a monthly workshop series, with topics such as how to get corporate or foundation support. A major portion of Arts Bridge is multicultural, and this is one neighborhood that has that diversity." The different groups who live in Uptown have different aims. The artists want it arty, out-of-the-way, open to those off the mainstream and, most important, affordable. The lower-and working-class residents want a family atmosphere and neighbors willing to accept them as opposed to trying to eject them. The middle- to upper-class want comfort, safety, security, but mixed with enough funk to remind them of the reasons they chose Uptown rather than Lincoln Park. The new arrivals want a place where they can set their feet on the ground and establish themselves while moving to pursue the American dream. Will Uptown continue to be all things to all people? David K. Fremon is a free-lance writer in Chicago. He is author of the book, Chicago Politics: Ward by Ward.